In this article Ross Hauser, MD discusses chronic ankle sprain treatment, the problems of diagnosing ankle sprains and long-term problems of ankle instability. Non-surgical options including the use of Prolotherapy, Platelet Rich Plasma Therapy, and Stem Cell Prolotherapy are also discussed. The most common type of ankle sprain is the “rolled” or “twisted” ankle, inversion injury, turning the ankle inward, injuring or tearing the ligaments on the lateral (outer) side of the ankle, usually the anterior talofibular and the tibiofibular ligaments. Many times a patient will report that they simply “twisted” their ankle without realizing the structural damage that could have been done. The inside of the ankle is held together by a group of ligaments called the deltoid ligament. This ligament is injured from turning the foot outward, as can happen when falling down stairs or mis-stepping. Once an ankle is sprained, the injury may take a few weeks to many months to fully heal. The injured ankle often remains a little weaker and less stable than the uninjured one. Left untreated, ankle instability leads to cartilage deterioration with resultant degenerative arthritis. If a ligament does not heal, joint instability occurs and the end-result is ankle arthritis with good prospects for fusion or ankle replacement surgery. Treated with stronger NSAIDs or cortisone shots can also lead the patient to surgery. Cortisone has been shown to further degenerate the injured ligaments in joints, leading the patient towards more joint instability, degeneration and eventually osteoarthritis. Once diagnosed with osteoarthritis that is seemingly irreversible, the words “ankle fusion,” “ankle arthroscopy,” and “ankle joint replacement” are introduced into the consultation. 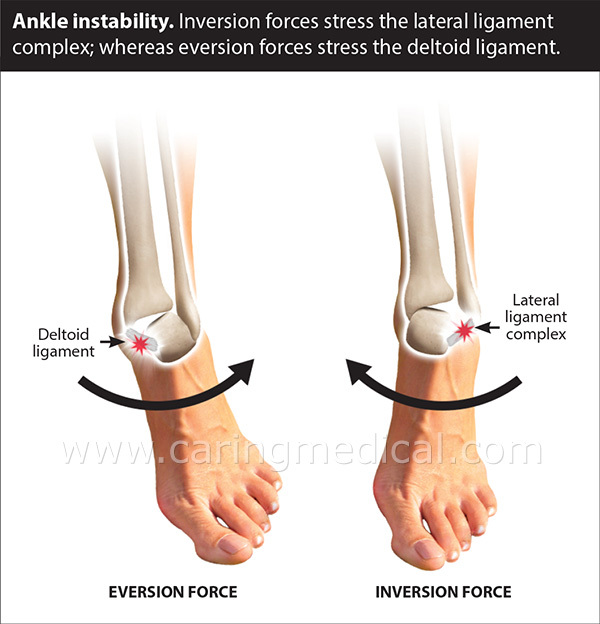 decreased range of motion or excessive motion from ankle instability. They often ask what is causing their “weak ankles,” the continued “popping,”and “clicking” sound they hear. The patients know the ankle is not right. Unfortunately, literature examining chronic ankle instability is often conflicting and confusing to patients. The Irish researchers were able to identify jumping and landing ability and non-reported ankle pain up to 6 months as being high risk factors for ankle instability, but they were not the only factors. “Ankle sprains are a significant clinical problem. Researchers have identified a multitude of factors contributing to the presence of recurrent ankle sprains including deficits in balance, postural control, kinematics, muscle activity, strength, range of motion, ligament laxity and bone/joint characteristics. In 2017, at the completion of their review, the researchers published their findings in the journal Sports medicine. Further, conservative treatment is indicated for the acute, simple ankle sprain without accompanying injuries and also in cases of chronic instability. As you will see below chronic ankle instability is a whole joint problem and not one isolated to a single ligament element.For a full discussion please see my article on various ankle surgery options. Let’s do a medical equation and combine the research of two studies. Above the German doctors said the simple ankle sprain that looks like it healed should be monitored to prevent it from becoming a potentially complicated sprain which is at risk of transition to chronic ankle instability. A “new” ankle sprain may be an old ankle injury that went undetected and never healed. Doctors should be aware that chronic ankle instability can be a problem of an injury that never healed. In the Journal of physical therapy science, Doctors at South Korea’s Sport Science Institute, Incheon National University looked at male soccer players and found the complexity of the problem needed to be solved by addressing the entire ankle joint and not simply a ligament tear or chronic ligament weakness. Over 70% of patients who experience ankle sprains report additional symptoms resembling chronic ankle instability, such as re-injury or ankle function abnormalities. Chronic ankle instability has been connected to reduced muscle strength and proprioception (ankle joint function as a whole) which interferes with postural control. It is presumed that chronic ankle instability is caused by complex functional deterioration. It is not a simple solution. One curious symptom and one that should clearly point to chronic ankle instability and should be explored in patients with chronic knee instability and hip instability is Dynamic balance deficits. In two studies from University College Dublin, patients who suffered from an acute ankle sprain were followed and tested for problems of balance. Not only were their injured ankles tested but also the same side knees and hips. At 6 months follow up (8) and one-year follow (9) up after a single ankle sprain event, patients showed reduced balance that created stress on the entire limb side, hip, knee, and ankle included. Elastic bandages, tape, do they provide stability and balance or worse? A team of physical therapists in Spain have published a soon to be released study (April 2018) in the journal Disability and rehabilitation. They wanted to report on their findings surrounding the immediate and prolonged (one week) effects of elastic bandage on balance control in subjects with chronic ankle instability. Twenty-eight individuals: 14 were randomly assigned to the elastic bandage group (7 men, 7 women) and 14 were assigned to the non-standardized tape (typical white adhesive tape) group (9 men, 5 women). This study did not observe differences between elastic bandage group and non-standardized tape group during the follow-up in the majority of measurements. Elastic bandage of the ankle joint has no advantage as compared to the non-standardised tape. The effects of the bandages could be due to a greater subjective sense of security. It is important to be prudent with the use of bandage, since a greater sense of safety could also bring with it a greater risk of injury. My comment here: Short-term, ankle bandages and tape are to be used with caution, long-term, keep the tape and bandage on because there is little else that can be offered. UNLESS, you are familiar with Prolotherapy. This section will deal with the question, How do you treat a sprained ankle? Writing in the medical journal Practical Pain Management, we reported on 19 patients surveyed following Prolotherapy ankle treatments. These patients said they had less pain, stiffness, crepitating, depressed and anxious thoughts, medication usage, as well as improved range of motion, walking ability, sleep and exercise ability. Patients reported an average of 3.3 years (40 months) of pain and on average saw more than three doctors before receiving Prolotherapy. The average patient was taking at least one pain medication. Sixty-three percent (12) stated that the consensus of their medical doctor(s) was that there were no other treatment options for their chronic pain. Eleven percent (2) stated that the only other treatment option for their chronic ankle pain was surgery. Patients received an average of 4.4 Prolotherapy treatments per ankle. The average time of follow-up after their last Prolotherapy session was 21 months. Patients were asked to rate their pain and stiffness levels on a scale of 1 to 10 on a visual analog scale (VAS) with 1 being no pain/stiffness and 10 being severe crippling pain/stiffness. The 19 ankles had an average starting pain level of 7.9 and stiffness of 5.4. Ninety-five percent reported a starting pain level of 6 or greater, while none had a starting pain level of four or less. After Prolotherapy none had a pain level of 6 or greater, and 90% of patients reported at least a 50% reduction in pain. One-hundred percent of patients stated their pain and stiffness was better after Prolotherapy. Over 78% reported that pain and stiffness since their last session had not returned. 74% noted problems with walking, but only 37% experienced compromised walking after. In regard to exercise ability before Prolotherapy, only 47% could exercise longer than 30 minutes, but after Prolotherapy this increased to 90%. For significant deterioration, we may recommend to patients a more aggressive approach incorporating Platelet Rich Plasma and Stem Cell Therapy injections. In the medical journal Clinical Medicine Insights Arthritis and Musculoskeletal Disorders, Caring Medical published our findings in seven patients. Patient case 1 represented an ankle case. A 59-year-old female patient come into our office with right ankle pain following a lateral sprain. The patient reported she could barely walk without severe ankle pain. 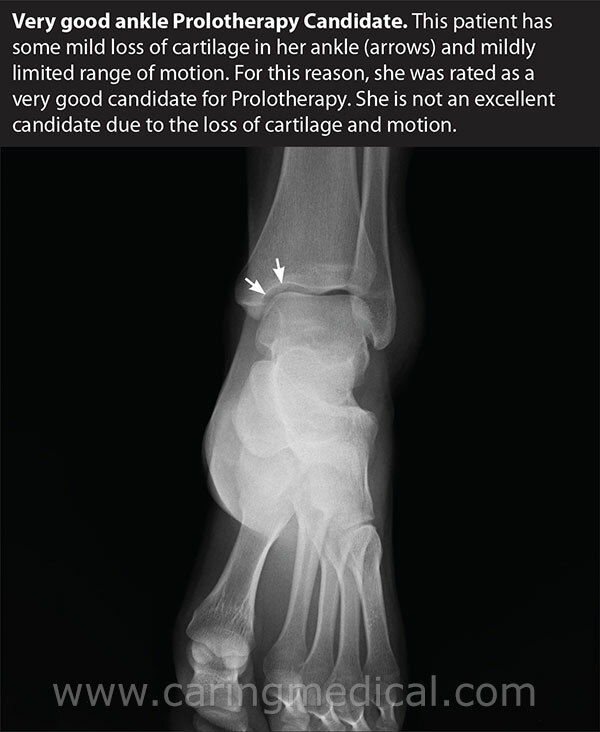 The patient had unsuccessful treatment with cortisone injections and was being recommended to ankle fusion based on X-ray and MRI finding that suggested osteoarthritis, avascular necrosis of the talus, and synovitis. Please see Caring Medical and Rehabilitation published research on bone marrow aspirate injections into the talus and case history of regenerative repair. The patient received four bone marrow/dextrose treatments over a period of eight months. At second treatment, the patient reported the ability to stand for long periods and walk for half a mile without pain. At third treatment, she reported improved range of motion, less frequent pain, and ability to take two mile walks on hilly, uneven ground, although steep climbs still induced pain. A less common but well known ankle injury is the “high ankle sprain.” This is damage to the ligaments that connect the shin bones tibia to the fibula. Because of the high impact stress at the tibia and fibula junction, the syndesmosis joint, the high ankle sprain is difficulty to heal. In recent research doctors examined the success of platelet-rich plasma (PRP) into the injured antero-inferior tibio-fibular ligaments (AITFL) in athletes on return to play (RTP). They further studied the issues of ankle instability and stability before and after the PRP ankle injections. Sixteen elite athletes with AITFL tears were randomized to a treatment group receiving injections of PRP or to a control group. All patients followed an identical rehabilitation protocol and RTP criteria. Patients were prospectively evaluated for clinical ability to return to full activity and residual pain. 11 Hauser RA, Hauser, MA, Cukla J. Dextrose Prolotherapy Injections for Chronic Ankle Pain Practical PAIN MANAGEMENT, January/February 2010 p 70-76.